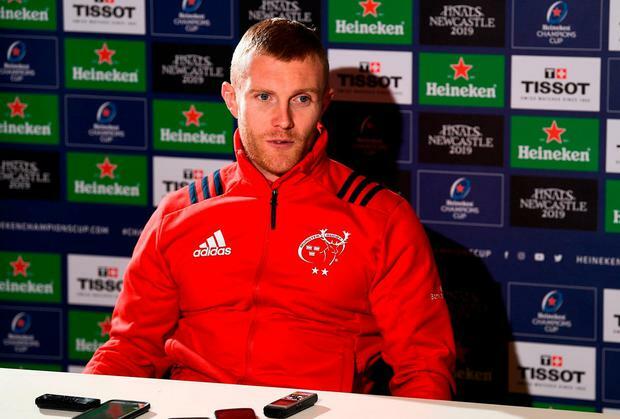 Keith Earls believes the decision of 12 players to commit their futures to Munster is a ringing endorsement of the direction the team is travelling under Johann van Graan. The province yesterday confirmed that a host of first-teamers including internationals Niall Scannell, John Ryan and Rory Scannell have signed new contracts, following in the foot-steps of Conor Murray and Earls. Van Graan celebrated his first year in the job with a win over Edinburgh last weekend and is hoping to take full control of Pool 2 of the Heineken Champions Cup with victory over Castres on Sunday. And yesterday's announcement will help boost morale ahead of the visit of the French champions. "It's great, a lot of young lads as well," Earls said. "The Scannells and Arno (Botha), who's come in and been great for us. The commitment is brilliant, it just shows that we are building a squad to move on to great things hopefully. "There's a good bunch of them there that are home-grown, which is brilliant. This is where they want to be. Conor signing up as well, it's brilliant that he's the best player in the world and he wants to play his rugby here and win trophies here which is a massive boost for us." Mike Haley (head), Andrew Conway (knee) and Stephen Archer (illness) are doubts for Sunday. Prop Jeremy Loughman has been added to the European squad after joining Botha in penning a one-year deal. The Scannells, Rhys Marshall, Darren Sweetnam, Jack O'Donoghue, JJ Hanrahan, Alex Wootton, Fineen Wycherley and Calvin Nash have all signed two-year deals, while Ryan has signed on until 2022. "If you look at the quality of the guys, that it hugely important for the club going forward and brilliant for a coach and an organisation to have that amount of quality players staying on," Van Graan said.